The notion of sound is intuitively given by human perception. It is common knowledge that “audible” signals, originating at various sources of sound and propagating through an acoustic medium, are “picked up” by the human ear. The reaction of the eardrums to pressure changes in the air is an elementary example of vibroacoustic fluid-structure interaction. The sources of sound can be of different nature. These notes are concerned with the computational evaluation of the sound in thin-walled cabins like passenger compartments in cars, trains, ships, or airplanes. The walls of these cabins are in contact with an acoustic medium that fills the interior volume of the cabin (also called the acoustic cavity). By interaction between the fluid particles, the ocsillations at the structure-fluid interface spread through the cavity in the form of waves which are, in general, reflected at the boundaries. The interference of incoming and reflected waves may lead to resonant standing waves. This effect can be the cause for booming noise in vehicle cabins. It is the goal of vibroacoustic simulations to predict such unwanted effects and to explore design variants that are aimed at reducing the noise level over the frequency range of interest. 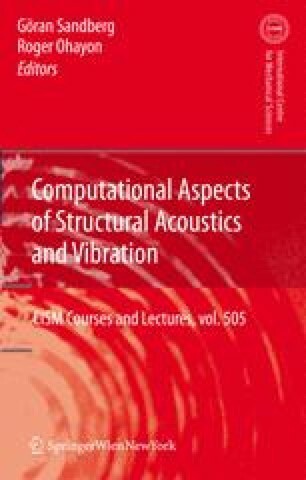 Speaking more generally, the goal of the simulations consists in a realistic computational evaluation of the vibroacoustic comfort level. A basic knowledge of the underlying physical effects and their mathematical formulation is essential for the setup of suitable computational models as well as for the interpretation of the numerical results.